Product ID #: 216 - Ship Wt: 1 LBS..
1988, 16 pages, by Kristeen Gough, 8.5" x 11"
Meet Cami and Zaper who help children understand hard to explain emotions. Cami and Zaper are learning about feeling happy and sad. These adorable characters are in full color and the book includes the manual alphabet and glossary of signs. 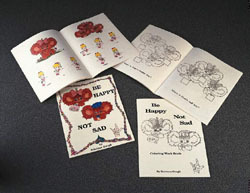 "Be Happy Not Sad" comes complete with a 16 page coloring workbook. This helps enhance the lessons of Cami and Zaper through fun mazes and coloring activities and enables recognition of the reader's story understanding.